Mount Athos is a self-governing part of the Greek State, located on the peninsula of Mount Athos in Halkidiki in Macedonia. It includes twenty Sacred Monasteries and other monastic foundations and is unofficially described as “Autonomous Monastic State”. It is the only place in Greece that is allotted to the prayer and worship of God. Mount Athos is about 50 km long, 8 to 12 km wide and covers about 350 square kilometers. Since 1988, it has been listed as World Heritage Monuments. 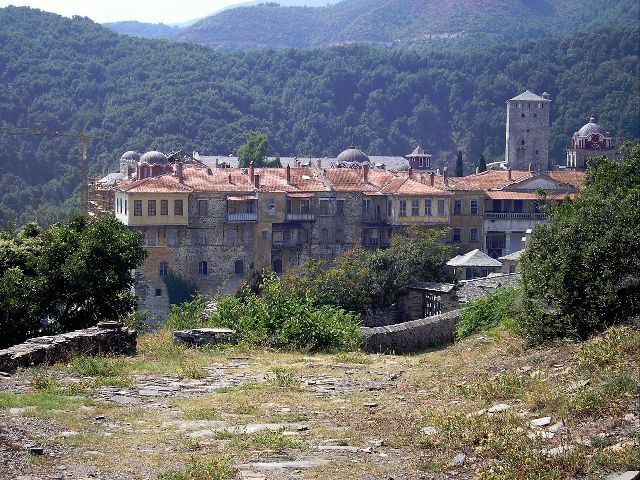 A fair bit of advance preparation and battling with bureaucracy is necessary to visit Mount Athos, since only 100 Orthodox and 10 non-Orthodox visitors per day are permitted. A permit (diamonitirion) is required for both individuals and groups. This is issued by the Ministry of Foreign Affairs, Directorate of Churches (at No 2, Zalokosta Street, in Athens, tel: 210 3626 894) or by the Ministry of Northern Greece, Directorate of Civil Affairs at Diikitiriou Square in Thessaloniki, tel. 2310 270.092. Women are not admitted into the territory. Overnight stay is forbidden to those under 18. Diamonitiria (permits to stay as a pilgrim) are issued by the offices of Mount Athos, at Ouranoupolis (on the right side of the port). In order to get their diamonitirion visitors must show their identity cards and pay the sum of €18 (Orthodox visitors), €30 (non-Orthodox) or €10 (non-Orthodox but student). Foreign visitors also need a passport; if you are Orthodox but not Greek, you will need to prove this (a letter from a priest or a baptismal certificate will do). First contact the Pilgrims’ Bureau (address below). They may need plenty of notice of your proposed visit – up to six months if you plan to visit during the summer months of June, July, and August when the monasteries are full to over-flowing with Greek and Orthodox pilgrims, but as little as a few days outside the peak season. Once you have gained permission from the Pilgrims’ Bureau you must contact each monastery where you plan to stay. Without their consent you will be turned away. A good site for further details of monasteries and how to contact each one by phone or fax is here. 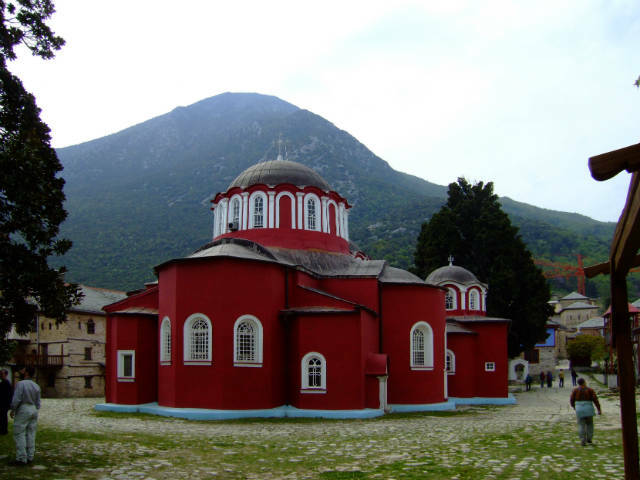 The monasteries on Mount Athos can be reached only by ferry, either from Ouranoupolis (for west coast monasteries) or from Ierissos for those on the east coast. Many visitors arrive at the port of Dafni (Daphne), from where they continue by bus to the “capital” Karyes. Smaller boats, people carriers and taxis ferry pilgrims from monastery to monastery. Boat schedules. There are also sightseeing boats that do tours around the peninsula without landing; these require no permits, and are the only option for women who want to get a glimpse of Mount Athos. It is possible to walk from monastery to monastery. The longest walk is from Agia Anna to Great Lavra (six to seven hours). Many of the ancient footpaths are still clear but from time to time it will be necessary to walk on the roads. According to mythology the name, Athos belonged to a Thracian giant. In the conflict between gods and giants, Athos threw a huge stone mass against God Poseidon, but escaped from his hands and fell into the sea forming the piece of land that is today the Mount Athos. Another version says that Neptune was the one who dropped the rock against Athon. The rock plunged Athon and buried him beneath. This rock also created Mount Athos. Until the 3rd c. There were many small Greek cities on the peninsula of Athos. Later, for reasons unknown, these cities were ruined or destroyed, leaving the place desolate for several centuries. One of the traditions says that Virgin Mary escaped her course when she was trying to sail to Cyprus and arrived at Mount Athos, at the harbor where the monastery of Iveron is today. Then the voice of the Lord was heard, saying, “Let this place be your lot, and paradise, and salvation to the wilderness.” Since then, the Holy Mountain is considered as a clergy and orchard of the Virgin Mary. From the 5th c. Century human beings began to appear in the area when the first monks, who were disappointed with the everyday life of society, found this beautiful and desolate place ideal to worship God better. Everyone is called upon to serve God in many different ways. Monasticism is a special call, a special way for a man to serve God and mankind.Every man has a “gift of grace”, as Apostle Paul says. The call to become a monk. God Himself speaks directly to the future monk or nun (with signs, clues or internal interpretations), or through his Spirit. Monasticism is one of the ways for a man to reach the “Divine”. This is done in isolation, prayer, exercise, obedience to the Elder and fasting. Prayer is the right, duty and assistance of every believer. For the monk, prayer is the reason for its existence in life, in the world. There are various forms of prayer, for different circumstances and needs. The “Prayer of Jesus”, which the monks say in Mount Athos consists of the words: “Lord Jesus Christ, Son of God, praise the sinner.” It is also called “Heart of Prayer”.